One of the most important rules a learner of English should learn is basic word order in English. It is very common for Greek EFL learners to write incorrect sentences as Greek syntax is very flexible in terms of word order. The English language however follows stricter rules and any sentence that does not follow the rules not only sounds wrong but is in fact wrong. We tend to emphasize the order of certain words within a sentence, like for example adverbs of frequency, but we don't give our students enough practice on basic sentence structure. 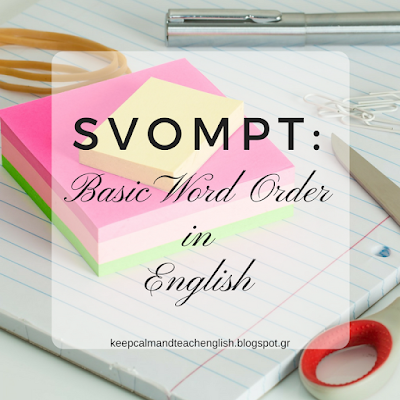 The following lesson has been in my mind for a long time as whenever I correct my students' writings I observe the same word order mistakes over and over again. I found an interesting diagram on SVOMPT in engames.eu but I decided to design it a bit different.